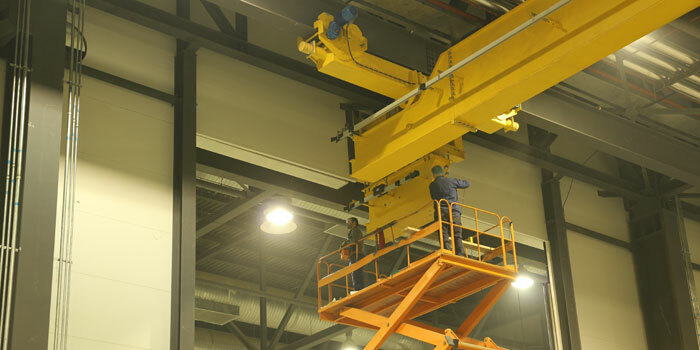 Services | GH crane and hoist manufacturer. To locate the GH Official Service Center near you, click on the CONTACT section. Through preventive maintenance of your equipment, you can keep your instalation always in optimal conditions, conform to European and National safety regulations, also avoiding the lost-time in breakdown caused by the deterioration of any of the wearing parts, which will save you time and money. With experience gained since 1958 and more than 110,000 cranes in the market, we have the skills to solve any operational or parts-related problem that your cranes could have. The Modernization services help to increase the service life of your equipment, adapting it to your new needs and improving the safety. Thanks to our experience and technology knowledgement, we can tackle all type of projects for crane modernization, originally manufactured by GH or others. Diprelevaisour central warehouse in Madrid-Spain that supplies spare parts to our services delegations all over the world, with the highest quality and guaranteed and within a very short time condition. Buying the spare parts from official GH Service Network, we guarantee you thoseare from original manufacture and with company warranty.